The Mobile Dairy Classroom Program visited General Ricardo Sanchez Elementary this past Thursday. This traveling milking parlor featured a live cow and an oral presentation. The presenter demonstrated how to milk a cow, described how milk goes from the farm to the consumer, and then answered our student’s questions. This innovative program brought the dairy experience directly to our students. It provided our students a great experience which included math, science, health (nutrition), and agriculture, all presented in an outdoor classroom format. 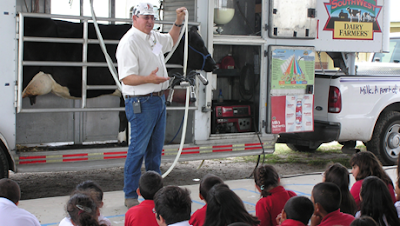 Pictured above is Mr. Randy Miller, Lucy (dairy cow), and General Ricardo Sanchez Elementary Students (Submitted by A. B. Villarreal).